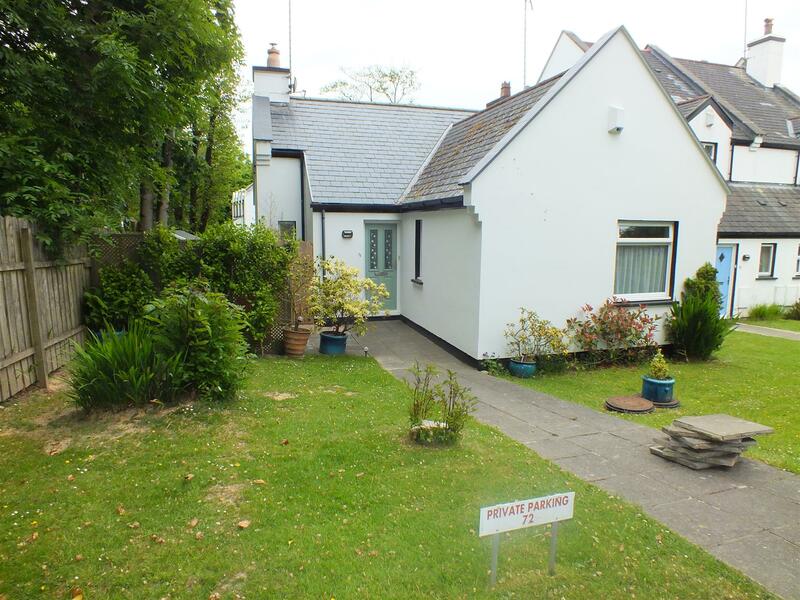 An Individual End of Terrace Dormer Bungalow Set on a Pleasant Plot. Easy Access to Douglas & the South. Walking Distance to the Golf Club. Briefly Comprising Spacious Reception Hall with Cloakroom WC Off. Generous Lounge and Stylish Breakfast Kitchen - Refitted 2015. Large Ground Floor Bedroom with Wardrobes & En Suite Shower. First Floor Double Bedroom & En Suite Bathroom. Large Attic Store Area. Gas Fired Central Heating, uPVC Double Glazing & Protective Exterior Finish. Open Plan Frontage with Residents Parking In Front. Enclosed Rear Garden with Patio & Lawn - Enjoying Much Privacy. A spacious area which can easily accommodate storage units and a coat stand. Cupboard housing the consumer unit. Telephone and power points. Security system. Smoke detector. Doors to the cloakroom WC, bedroom and lounge. A well proportioned room with stairs leading off to the first floor. Featuring a recessed, glass fronted multi fuel stove and enjoying garden views through sliding uPVC patio doors. An additional window to the front provides extra natural light. TV and satellite points. Carbon Monoxide monitor. Door to the breakfast kitchen. Re-fitted approximately 2015 with a quality range of high gloss, cream coloured wall, base and deep drawer units together with solid oak block work surfaces incorporating a large ceramic sink with a mixer spray/tap. Integrated fridge and freezer. Plumbing for a washing machine and dishwasher. Built-in oven and an inset ceramic hob with a stylish back plate and filter unit. Ceiling spotlights. A half double glazed uPVC door with fitted blinds leads out to the patio. 'Vaillant' gas fired combi boiler. 'Manrose' extractor. Vinyl floor covering. Ample space for a four seater dining suite. A dual purpose area located under the stairs. Space to one side for storage/coats. Fitted with a white suite of hand basin and WC. Shaver light. Ladder style towel radiator. 'Manrose' extractor. A superb room, located to the front of the property. Benefiting form a deep set built-in wardrobe with mirror fronted sliding doors. Space for a 'Super King' size bed and additional free standing furniture. Two uPVC windows. Telephone point. Door to the en-suite shower room. Re-fitted with a large, tiled enclosure with a fixed glass screen and fully plumbed shower. High gloss vanity unit incorporating a top mounted basin with a lever mixer tap. 'Manrose' extractor. Wood effect floor covering. Ladder style towel radiator. Access via a low level door to an extensive attic store area with good height in the centre. Light, boarded and double insulation. A generous 'L shaped' double room with an angled ceiling. Currently utilised as a study/guest room. 'Velux' roof light. Two timber framed double glazed windows. TV and internet connections. NB measurement given includes the enclosed staircase. Having high angled ceilings and partial tiling. Fitted with a white suite of panelled bath with a mixer shower attachment, WC and a pedestal basin with a tiled splashback and angle poise mirror above. Extraction. Ceiling spotlights. Vinyl floor covering. Space for a low level storage unit. To the front of the property is an open plan, lawned garden, the property being well set back from the road with communal parking bays to the front boundary. Gated access to the enclosed rear garden. Well fenced for privacy and shelter. Laid to lawn with a raised, block paved patio adjacent to the lounge.